Hanoi- The country’s key economic indicators have improved, with gross domestic product (GDP) in January-June estimated to expand 6.11% compared to the same period last year. 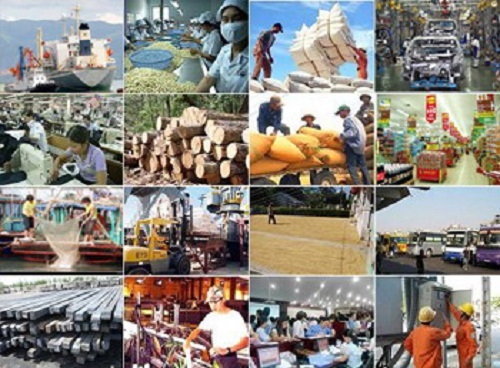 This is the highest H1 economic growth since 2010, according to the Ministry of Planning and Investment’s latest report on production, trade, services and investment in the first six months of the year, VietnamPlus reports. Deputy Minister of Planning and Investment Dang Huy Dong told a review meeting in Hanoi on June 24 that the H1 GDP growth of 6.11% indicated that the economy has got back to the high growth path since 2014. The industrial and construction sectors are the major contributors to the GDP expansion in January-June with a year-on-year increase of 8.36%, according to the report. The respective growth rates of services and agro-aqua-forestry sectors are 6.16% and 2.16%. The H1 Index of Industrial Production (IIP) is 9.6%, much higher than the 5.8% in the same period last year. The electricity generation and distribution sector has registered the highest growth of 11.2% in the period, followed by processing-manufacturing with 10% and mining with 8.2%. More enterprises have been established in the year to June. The report said there have been more than 14,400 business startups with combined registered capital of nearly VND282.4 trillion (over US$12.9 billion), up 21.7% in number and 22.3% in capital year-on-year respectively. The average registered capital of an enterprise is VND6.2 billion, up 0.5% over a year ago. The number of enterprises which have gone dissolved and stopped operations has been 4,700, down 0.9% compared to the first half of last year. More than 27,000 enterprises have suspended operations, falling 5.8% year-on-year. Notably, more than 8,500 enterprises have been back to business this year, up 2.2% versus the year-ago period. Aggregate demand on the domestic market has improved in the period as total sales of goods and services have gone up 9.76% year-on-year, higher than the increase of 5.7% over the same period of 2014. With the higher economic growth in the first half of this year, the Government’s target for at least 6.2% this year is obtainable. Speaking at the Vietnam Business Forum in Hanoi earlier this month, Minister of Planning and Investment Bui Quang Vinh said the country could achieve GDP growth of 6.12% or higher in the first six months if relevant agencies could find effective solutions to fuel growth in agricultural and tourism sectors. Prime Minister Nguyen Tan Dung told the forum that the nation is aiming for higher but sustainable economic growth of 6.5-7% in the 2016-2020 period and the Government would do what it could to realize this target. However, the country has had to cope with more challenges this year. Nguyen Duc Hung, deputy head of the Agriculture Department under the Ministry of Agriculture and Rural Development, told the meeting that drought and saltwater intrusion have damaged crops in a number of provinces nationwide. Meanwhile, Nguyen Thuy Hien, deputy head of the Planning Department at the Ministry of Industry and Trade, said exports of domestic enterprises have plunged this year while those of foreign-invested firms have increased 16% over the first six months of last year. “Reality has shown domestic enterprises are having difficulty boosting exports,” Hien said. She said agro-aqua-forestry outbound sales have dropped this year. Nguyen Van Toan, vice chairman of the Foreign Investment Business Association, said the performance of supporting industries has not improved much and the technology transfer of foreign-invested companies to Vietnam is still lower than expected. He said Vietnam does not have many firms in supporting industries to capitalize on the opportunities from the free trade agreements that the country is implementing and will sign with partners.